It’s that time of year when I start to bake with creme eggs. Over the last couple of years I’ve made cupcakes, brownies and shortbread so I wasn’t too sure what to do this time. I experimented making creme egg doughnuts, using custard and cream to make the white and the yellow of the egg. Not having the right equipment to make fried doughnuts meant I couldn’t make it work well enough — I’ll get a recipe sorted next time though. I did like the idea of using custard and cream though, it has the right egg colours but it’s a slightly different take on egg whites and yolk. 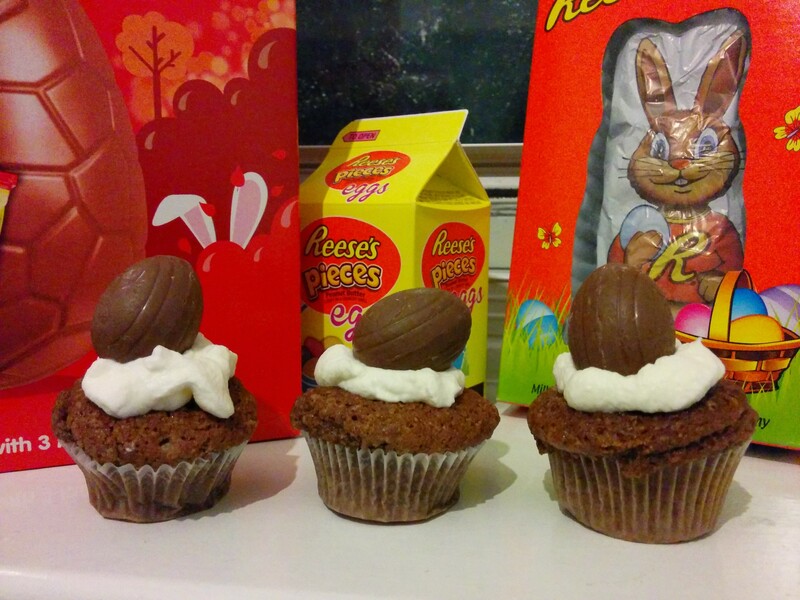 I then used them in the safe territory of a cupcake and made mini creme egg cupcakes. You will need a mini muffin tray, but if not then you can just double the mixture and make normal sized cupcakes. And 250ml of whipping cream and a packet of mini creme eggs. Begin by making the custard as this will then have time to cool and set while the cakes are baking. Start by pouring the milk into a saucepan and put on a gentle heat. In a bowl beat together the egg yolks (keep the separated egg white for something else such as meringues) with the sugar, vanilla extract and cornstarch. When the milk is warm pour it slowly into the egg yolk and sugar mix, stirring gently. Then when they are mixed together pour it all back into the saucepan and put back on the heat. Then stir the custard until it thickens. It should take about 10 to 15 minutes. The test is to see if the custard sticks on the back of a wooden spoon. If it runs straight off it needs a bit more time. Then pour into a clean bowl and cover with cling film. Actually push the cling film onto the top of the custard, this prevents a film from developing on the custard as it cools. Pop it in the fridge to cool and set. Next, make the cake. Beat the sugar and butter together. When it’s creamy add the egg to the mix. Then the flour, baking powder and milk. Finish with the flavourings, the vanilla extract and the cocoa powder. They are only little cakes but I think it works to have them very chocolatey tasting in the spirit of Easter. Spoon the mix into mini cupcake cases, you don’t need much before it spills over the tiny cases when cooking. Then put in the oven at 180 degrees celsius for about fifteen minutes. Keep an eye on them because they’re small. When they’ve finished baking take them out the oven and allow them to cool. Now whip the cream, it needs to be stiff enough to hold it’s shape when piped on the top of the cakes. Make a hole in the middle of your cool cupcakes and fill it with your cold custard. A couple of teaspoons should be enough and noticeable. Then put the whipped cream in a piping bag and squidge it on top of your cake, covering the hole and custard. Do this on all of your cakes. 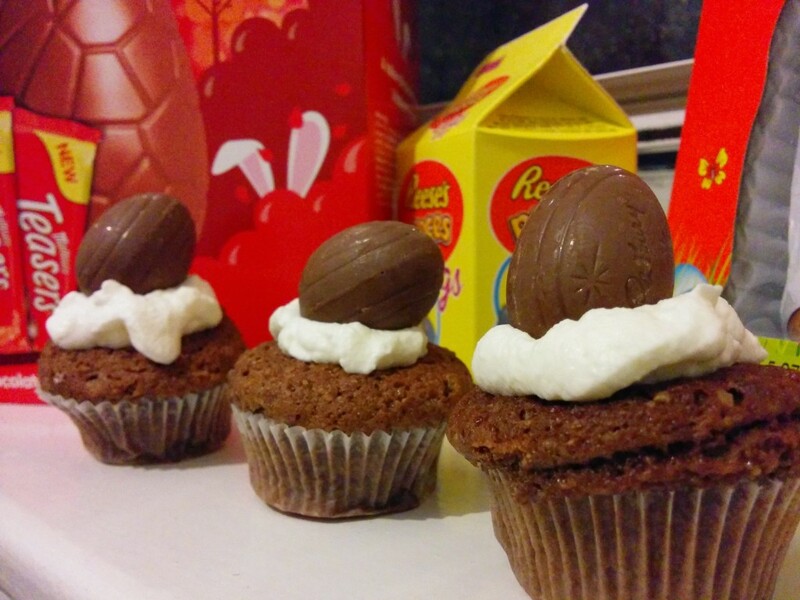 To finish unwrap your mini creme eggs and put on top of your miniature cakes. The cakes are just an assembly job really, the custard is a bit complicated but actually quite fun to make once you’re used to it. If you fancy trying out one of my other creme egg recipes you can find them here. Here’s brownies, millionaire’s shortbread and whole creme egg cupcakes.